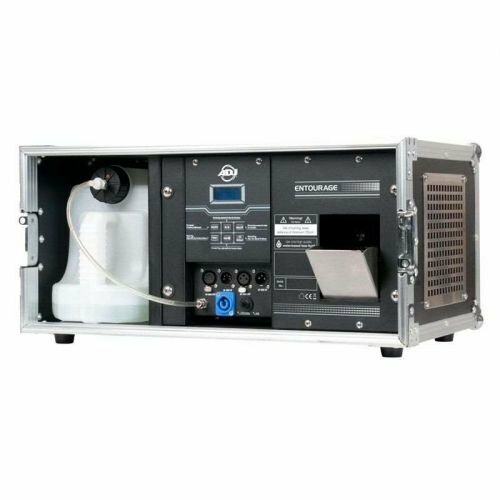 The ADJ Entourage is a 1400W professional grade touring Faze Machine built into a durable flight case. This pro Fazer offers a very quick warm-up time and produces a massive amount of atmosphere. The Entourage features an easy to read LED function display with fog timer, continuous fog and manual fog options. Connections include 3-pin and 5-pin DMX and PowerCon AC input. Uses high quality water based fog fluid. Dimensions (LxWxH): 21" x 15.25" x 9.75" / 533x387x249mm Weight: 47 lbs. / 21.3 kg.